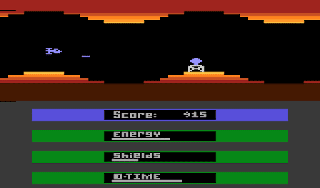 Laser Gates is a horizontally scrolling shooter that's exclusive to the Atari 2600. The Cryptic Computer that's maintained peace for five centuries has malfunctioned and to stop it from self destructing you must pilot the Dante Dart and destroy the failsafe detonators. While blasting incoming mortar fire and homing missiles, you must also avoid forcefields that either flash on/off, move up/down, or open and close with a vertical crushing motion. Energy can be topped up by collecting pods, but your Shield is irreparable and the Dart will explode if it takes too much damage. The scrolling is very smooth with a rock-solid frame-rate, and while the confined auto-scrolling stages are reminiscent of Scramble (1981, Arcades), the ability to turn around and shoot to the left harkens back to Defender (1981, Arcades). The action never feels cheap and the perfect collision detection ensures each hit you take is as a result of your own mistakes. Likewise, the controls are ultra responsive and moving swiftly and effectively around the screen is a breeze. There's also a wide range of enemies and hazards, and learning their patterns is a big part of the enjoyment. What's neat is that each has their own sound effect, so experts can recognise and plan attacks immediately. Admittedly, the game is very short with only four stages, but its replayability is greatly enhanced by the addition of randomly generated levels / enemies each time you play; it's a fantastic idea and somewhat novel for the time. There are a couple of minor niggles though, such as the small playfield that's surrounded by an unnecessarily large status display, and the 'dead zones' towards the left and right-hand sides that you can't move into. Laser Gates is an excellent shooter with tons of replay value thanks to its randomly generated levels, wide range of unique enemies, and tough, yet fair, difficulty curve. The well executed gameplay is complimented by fantastic controls too, and overall this is an easy game to recommend if you're looking for an obscure Atari 2600 shooter. 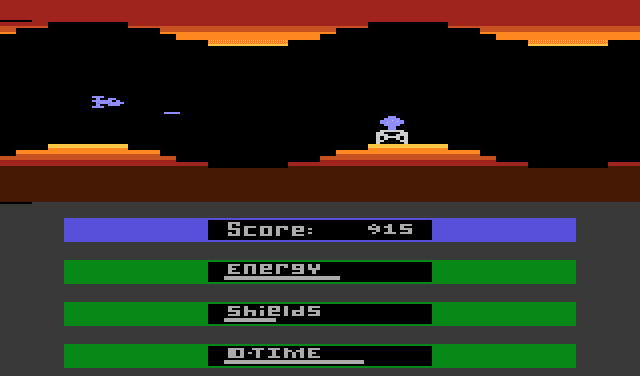 Random trivia: Programmer Dan Oliver also worked on Rescue Terra I (1982), Space Cavern (1981) and Telepathy (1983) for the Atari 2600.